1. Some trite and entirely meaningless statement comes out. “We need to work hard on defense, and execute on offense,” or maybe, “We need to shoot a high percentage, and rebound the basketball.” Basically, they’re blandly describing how to play their sport, which would be great if I was a visitor from the planet Xanax, or maybe if I was taking an Ebonics course. Otherwise, I just got dumberer from listening to them. 2. Something delightfully hilarious erupts from their lips, something beautiful and profound, like a stripper asking you back to the Champaign room. It could be Magic Johnson complimenting a team’s “Harmonism,” or Kevin Garnett telling you he’s “flabbergabanasted.” It could even be Patrick Ewing and his “We make a lot of money, but we also spend a lot of money” or Latrell Sprewell’s “I’ve got kids to feed.” Whatever it is, your life is immediately better than it was before they said it. "I've won at every level, except college and pro." -Shaquille O'Neal, on his lack of championships. "[My] career was sputtering until [I] did a 360 and got headed in the right direction." - NBA star Tracy McGrady, after signing with the Orlando Magic on Thursday. "Anything that doesn't progress gets stuck or left behind. Our new sponsor is a company with a great future." -Club president Fernando Ruiz of the Spanish basketball club Gijon Baloncesto, which has accepted sponsorship from a pornographic website. The website owners say they are considering supplying their girls to act as cheerleaders at Gijon's home games. "Play some Picasso." -Former New Jersey Net Chris Morris, to a piano player at a hotel bar while trying to impress a date. "Unstoppable, baby!" -Warrior rookie Marc Jackson to the Mavericks' bench, after hitting a lay-up during a 29-point loss. "No comment." -Michael Jordan, after being asked for his response to making the All-Interview Team. "I will shoot all you Asian (bleeps) ... Do you remember the Vietnam War? I'll kill y'all just like that." -Point guard Jason Williams to a fan of Asian descent sitting behind the Kings bench during a game at Golden State. Williams was fined $15,000 by the NBA. 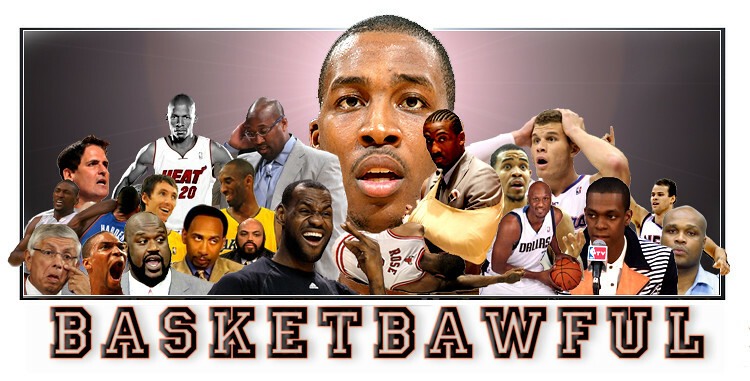 This blog is going to be devoted to the absolute worst of professional basketball. We'd call it NBAwful, but the NBA won't even let you talk about a game without their express written consent, and so I doubt they'd let us use that title. I'd hate for David Stern to try and lock us in the same cage he's keeping Ron Artest in. Yes, we'll cover about everything, from Uwe Blab to the 1991 Denver Nuggets, as well as the many ridiculous things our "favorite" players have said (Kobe: "I told Karl [Malone] I was going to f*** him up!") and done (Charles Barkley spitting on a 12-year old girl).